This is a distressing story and I advise caution while you read this. It is an account of my witnessing the death of a mountain rescue colleague. I am writing this as a cathartic piece and in no way intend this to be sensationalist in any way. For those who are beginning to know me, I hope it helps weave some detail into the rich tableaux of my life. 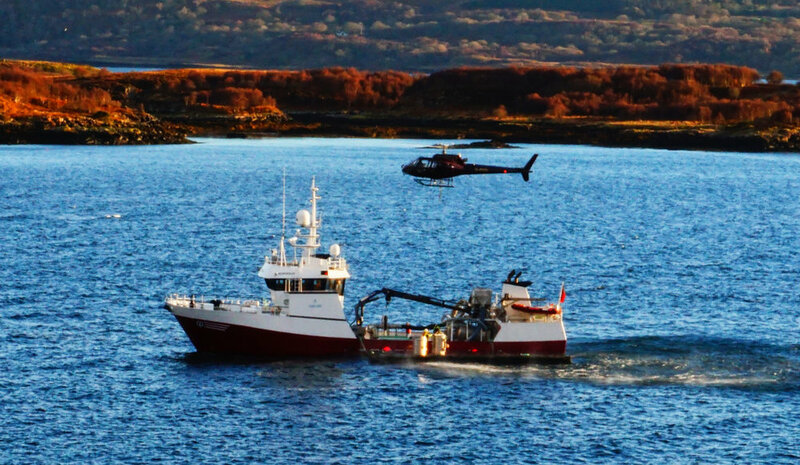 Over the last few days a helicopter has been used to transport Salmon smolts from the freshwater hatchery on Loch Frisa to a waiting fish-farm service ship in Tobermory Bay. The operation is incredibly slick with the helicopter making the run to and from the ship every five minutes or so. The pilot is obviously a skilled and adept professional and I can't help but be impressed when watching him sweep low over the tree tops with a large container hung below, depositing it with accustomed ease onto the deck of the ship. However, there is a darker psychological response when I watch and listen to the helicopter working away through the day. In particular it is the heavy clattering reverberations of the helicopter rotor blades which stir unsettled and deep memories which have led to post traumatic flashbacks and daytime terrors. You see, twenty years ago this last August (1997), I was present when a fellow rescuer lost his life during the course of a mountain rescue operation. I was living and working in Chimanimani on Zimbabwe's eastern border with Mozambique. I was the Chief Instructor at Outward Bound Zimbabwe, an outdoor activity centre where we delivered personal development outdoor training programmes. 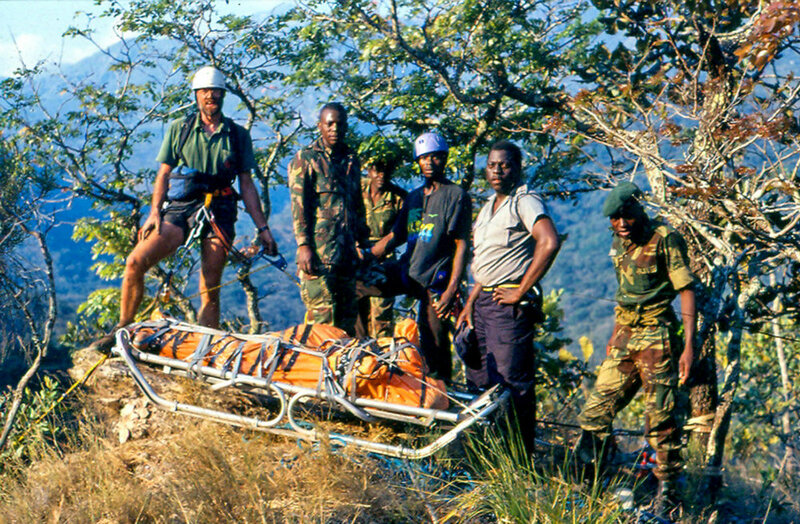 The staff of the centre made up the core of the newly established Chimanimani Mountain Rescue team which was surprisingly active despite the remoteness of the Chimanimani Mountains National Park. On this occasion it was just after mid-morning when a vehicle arrived at the centre with a distressed woman named Stella. She told us how she and her partner Ulf, a German foreign aid worker, were hiking in the remote and trackless terrain of the Haroni River gorge. They had set up camp for the night on a ridge and Ulf had gone off into the dark in search of water. He did not return. Stella remained in the tent on her own and after searching for him at daybreak, decided to walk out of the valley to seek help. She could not point out on a map where she thought the camp was, but she told us she could remember the route into it. She also described the camp as being on a narrow ridge. We, being myself and my line manager Pete, decided to initiate a search straight away and requested Stella show us the way to their camp. She told us that she had left the tent and all their belongings in the hope that Ulf would have a place to return to. By early afternoon a small search party with ropes and mountaineering equipment had driven to the closest point we could reach before setting out through the thick jungle like bush up and over a high ridge and then following Stella down an increasingly narrow spur towards the deep valley floor of the Haroni River. This is tough country and very few humans make their way into this section of the Haroni River which in effect has created a deep gorge in which thick and at times impenetrable rain forest has taken root. There are stories of old trading routes between the people of Zimbabwe and Mozambique that follow the spurs on either side of the gorge but these are quickly overgrown and easily lost. Anyone walking this area without local knowledge and certainly without a map, as it transpired the couple were doing, would soon find themselves disorientated and possibly lost. It seems as if this was the case for Ulf and Stella. By late afternoon, a couple of hours before dusk was to settle in Stella brought us to their camp. I remember walking through the forest and seeing their tent and a surge of hope rushing through me as we arrived calling out Ulf's name and expecting him to emerge from the tent. Of course our hopes were dashed and the resulting silence weighed heavily on all of us. The tent was pitched in a small clearing on the ridge. A couple of metres away on one side an audible stream tumbled into a narrow chasm, too deep to make out the bottom. On the other side of the ridge there was incredibly steep ground but no stream. Being in charge of the group I set to, giving folks search related tasks to fulfil. Tobias (Toby) and Shadreck, two brothers and instructors at Outward Bound, were tasked to search the upper reaches of the stream which flowed through a large thicket of impenetrable jungle. I searched down the ridge as far as I could reach before the thick forest of the Haroni Gorge proper prevented my progress. In the meantime Stella and Marion, another Outward Bound Instructor were to wait by the tent. Marion's presence was essential for calming Stella as we searched. We gave an hour for each search before coming together again and deciding on a new strategy. As I feared would be the case, neither search proved fruitiful. The deep chasm and the sound of the stream disappearing into it was becoming increasingly ominous and I feared our search would lead us down there. When we came together we found Stella and Marion in an excited state. They claimed to have seen a shadowy figure ascending through the forest of the ridgeline opposite, on the other side of the chasm. We called and hollered but there was no response. If it had been Ulf, I was certain he would have responded since we were clearly visible and also incredibly vocal. Toby and Shadreck, visibly shaken, took me to one side and told me that while they had been searching the forest they happened on a three metre Forest Cobra, a deadly snake but not prone to attacking humans, preferring instead to escape into the undergrowth. They went on to tell me that in their local Shona custom, when coming across a Forest Cobra when searching for a person means that this is a message from the ancestors that the missing is deceased. They were adamant that this was true in this case. Stella was in high spirits despite there being no response from the elusive shadowy figure she and Marion had seen. Toby, Shadreck and I set about establishing a fixed rope and safety line so that one of us could abseil into the chasm and search down there. The three of us were now certain that this was where we would find Ulf and time was of the essence should he be badly injured. We had hand held VHF radios so we could communicate with each other. Toby volunteered to be the one to abseil in. He disappeared into the dark depths and it wasn't more than a few minutes before my radio crackled into life with his request for me to join him in the chasm. I set about abseiling in and on my way down I could see why Toby had called me to descend. In a shallow pool at the base of an forty metre waterfall was Ulf. It was evident that he was dead because he was face down in the water and the waterfall was pattering into his lightly clad back, beating a bizarre drumming tattoo onto his rigor mortised body. Nevertheless, after disengaging from the abseil rope, I waded into the pool calling his name and reaching out to give him a shake. He was cold and stiff to the touch and I could clearly see a massive contusion to the back of his skull where his hair was matted with blood. I gently rolled him in the water, his body bobbing to my touch, and looked him in the face. His eyes were open and sightless and his face wan and pale, devoid of expression. Because I had found him face down in the water I made the assumption that his death had been immediate and if not, if it was by drowning, then he would have been unconscious while this happened. I looked up at the waterfall above me and concluded he must have climbed down to the lip of the fall in the dark and slipped, hitting his head on his way down. It would have been an almost instant demise. Toby was resolute but shaken, as was I. We respectfully discussed in low tones what our next steps should be. We did not have the resources to retrieve Ulf's body and anyway, it would soon be dark. The only option was to call for reinforcements and the equipment to deal with his corpse and evacuate him from the forest. However, the first task at hand was to inform Stella that we had found Ulf and this fell to me. Climbing out of the chasm was not an easy task. The walls were sheer and slippery so I had to rig prussiks with which to ascend the rope which being a climbing variety was stretchy and bounced with every move I made. I eased myself slowly upwards and out of the gorge to be met by an excited Stella who assumed that we had found Ulf alive but injured. I had barely enough time to regain my breath and unclip from the rope before informing her with as much solemn dignity I could muster that we had indeed found Ulf, but tragically he was dead. Whereupon she began wailing and keening in an alarming fashion, threatening to throw herself over the edge and into the chasm to join Ulf. Her distress was powerful and dreadfully moving and I could only reach out and attempt to hold her back. Thankfully Marion and Shadreck were able to prevent her from following through with her intent to join Ulf. Toby appeared shortly after and we held a quick counsel, deciding what our strategy should be. Stella needed to be removed from the scene. Her lamentation continued and we were fearful she would make a dash for the gorge at any time. It was thus decided that Shadreck and I would remain with the tent while Toby and Marion guided Stella back to our vehicle and return to the Outward Bound centre. Once there they would discuss with Pete the plans for Ulf's retrieval and evacuation. Dusk was setting in and it was important that the three of them were under way and back to the truck before dark set in. Shadreck and I settled down to an uncomfortable night beside Ulf and Stella's tent. We could not bring ourselves to make use of the shelter and the comfort of their sleeping bags inside. Instead, we sat and chatted long into the night with the flames of a small camp fire flickering on the boughs of the forest trees around us. We avoided discussing the fact that Ulf was lying dead a few metres away down in the chasm on the edge of the pool where I had gently laid him. We eventually curled up in the thick underfloor of the forest and slept fitfully. I remember waking in the small hours to the crunching sound of steady footsteps and being alarmed by this. Shining my head torch out into the cloying dark I illuminated a magnificent Bush Buck which stood and gazed at me impassively before wandering off up ridge. Early the next morning we managed to make contact with our base at the Outward Bound centre twenty kilometres away as the crow flies. Through the crackling radio reception I was able to determine that the Zimbabwe Airforce had been contacted and a helicopter carrying rescue personnel and the equipment required to retrieve Ulf's body would arrive at our location by midday. Shadreck and I settled in for a long morning waiting, lying back in the dappled sunshine and brushing the flies off our faces. We spent some time dismantling Ulf and Stella's tent and packing their belongings into their abandoned rucksacks. This felt very odd. A little later than promised the thudding sound of a helicopter broke the silence and before long a Vietnam War vintage Huey Bell clattered overhead and proceeded to circle our encampment. I had earlier scouted out a possible landing zone little way down the spur where I calculated a helicopter could hover and the rescue team members leap a few metres down to the ground. I had used this disembarkation process on a number of occasions when serving in mountain rescue teams in Britain. It is known as the hover jump. Unfortunately my communication with the pilot went unheeded and the helicopter slowly moved in above, the downdraught of the blades creating mayhem in the tree canopy about. The doors of the cabin were open and I could see Pete sitting alongside a police inspector with five Zimbabwe army commandos. Suddenly two black ropes were thrown from the cabin door and immediately began to flail in the fearsome downdraught. The ropes had not been weighted down. Despite this the commandos began abseiling from the helicopter to the ground about ten metres below them. One of the ropes became snagged and wrapped in the branches of a forest tree which was leaning out over the chasm where Ulf was lying. I could see that the soldier abseiling on the rope was now stuck in the dip with no means of touching the ground to release himself from the abseil. The only solution was for me to climb the tree. lean out over the gorge and cut the rope which I duly set about doing. It was one of those bizarre moments in my life where I'm hanging out over a desperate drop, with a helicopter metres above my head and being severely buffeted by the downdraught. The soldier seeing my intention to cut the rope shouted at me in alarm not to do so. As it was I was able to untangle the rope and he made it to the ground and I climbed back down the tree. With the two ropes now secured by holding them it was easy for the remaining team members to join us and the rescue paraphernalia including a stretcher to be lowered down. I remember very clearly meeting Pete with a huge manly, steely gripped handshake, while around us the dirty and dusty mayhem caused by the helicopter downdraught created a sense of confusion. The helicopter flew off to land high on the mountain pastures of the Chimanimani Mountains and wait for us to retrieve Ulf from the chasm. One member of the army team set about felling trees to create a landing zone for the helicopter and the rest of us moved up the ridge to the point where we could establish a pulley and hoist system by which we could lift Ulf out of the gorge. Pete abseiled into the chasm with the stretcher and set about placing Ulf's body on this while I organised the anchors for the pulley system and getting the ropes ready. Once everything was in place we worked together to hoist Pete and Ulf on the stretcher out of the gorge. It was tiring and hot work but we made good time and before long we were reunited. It was dreadfully sad to see the body bag with Ulf's remains strapped to the stretcher, his right arm in rigour reaching skywards. Ulf's Body Lies on the Stretcher. The Soldier on the Right Will Lose His Life. Pete and I set about clearing up the ropes and the equipment we had used while the rest of the team carried the stretcher and the packed away belongings of Ulf and Stella down to the newly created landing zone. Pete and I worked quickly because we could hear one of the soldiers calling up the helicopter on the radio and not long after this, the distinctive clatter and reverberation of the aircraft as it hove into view from over the mountains. We were out of sight of the landing zone and were unaware of what was being arranged down there. Everything packed into our rucksacks and the ropes neatly coiled we made out way through the trees to the new clearing, just large enough for the helicopter to make a landing. What struck us both immediately was the fact that the stretcher and all the gear was piled on the uphill side of the clearing. In fact it was a significant slope with a rock step to accentuate this. Both Pete and I were aghast because we realised that the embarkation of the helicopter would be made under the rotor blades from an uphill position. This was incredibly dangerous because of the risk of decapitation by the rotor blades. The helicopter was on it's final approach, a smoke canister had been ignited and thrown, and the soldiers with the policeman were lined alongside the stretcher ready to carry it onto the helicopter once it had landed. Pete attempted to dissuade the soldiers from proceeding with the landing so that we could rearrange ourselves on the downhill side of the slope but they would have none of it. Now that our role in the retrieval was complete, they were in command of the evacuation. It all seemed to happen slowly and yet quickly at the same time. As the helicopter came in I was reminded of the countless images I had viewed on TV of the same models landing in war ravaged Vietnam amidst smoke and mayhem to collect American soldiers. It felt much the same now. The powerful reverberation of the rotor blades as the helicopter descended was tangible and I felt it run through my body, coursing my muscles while my fear infused my whole being. As it came in and landed the ground erupted in a shattering of loose stones and leaves, whipped up by the downdraught. The piled up kit was in danger of being blown to all quarters of the landing zone, so I threw myself over it to hold it down. I was then aware of the proximity of the rotor blades to the ground and their tips to us as a group. I could see that the clearance between the ground at the tips was no more than slightly above waist height. To embark we would have to just about crawl in on our hands and knees. I was terrified. In the doorway of the helicopter stood a helmeted loadmaster with a blackened visor. I could make out his lips moving as he spoke to the pilot on their intercom. Then he casually waved the stretcher party forward and aghast I watched them duck under the blades, doubled up almost so that their chins were touching their knees and carry Ulf towards the open door. I really don't know how they managed this without being struck. I remember clearly seeing the grey sweat stained grey shirt of the police inspector being plucked up by the rotor blades, almost as if they were toying with him. While this was happening I was yelling to Pete that someone was going to die.. and I was working out when it came to my turn to embark what I would do. In those split seconds I determined I would climb as close to edge of the gorge and work my way round to the front of the helicopter and hopefully avoid the worst of the blades in that way. I didn't consider refusing to embark. All this happened in seconds. The stretcher with Ulf was hoisted into the dark cabin of the helicopter and the sergeant of the army group turned back to return to collect some of the piled up kit. He was doubled over as he made his way back and as he reached out to me to take hold of the rucksack I was proffering he lifted his head. His eyes met mine and then faster than an instant along with a distinctive metallic 'ting' he was gone! He had been hit by the rotor blade. What ensued was nothing short of farcical yet wholly tragic. I leaped back as did Pete and we attempted vainly to locate the injured man. He was hidden behind the rock step and all we could see were his violently twitching legs. One of the soldiers who had not made up the stretcher party simply ran away, disappearing into the surrounding forest. I looked across at the helicopter and saw the loadmaster talking to the pilot who was holding the craft steady with deft movements of the control stick and his foot pedals. The load master then waved the rest of us in in a manner which belied the situation. It seemed inconceivable but it appeared that we were to embark and we were going to depart without tending to the dead or injured soldier. Pete and I refused and there were a few long seconds where there was a stand off between us and the loadmaster who continued to wave us forward while we waved the helicopter away almost as if we were shooing crows off our lawn. Eventually the loadmaster desisted and with that the helicopter pulled away and flew off down the valley and away over the far off ridgeline. Silence prevailed except for the moans and gasps emanating from the dreadfully injured soldier. We rushed over to him to discover that half his helmet had disintegrated and with this much of the left side of his head. There was a gaping hole the size of a spread hand in his skull out of which oozed what was left of his brain matter. He was alive, his eyes were open and he was wailing but he was unconscious. I unpacked the largest field dressing I could find from my first aid kit but this barely covered a corner of the wound. I knelt beside him and desperately searched the depths of my wilderness medical training for some hope but I accepted that he was dying. Pete and I laid out a tarpaulin and gently lifted him onto this. With the other soldier who now had reappeared from hiding in the forest we carried the dying man down hill to a spot where we would wait for the return of the helicopter. I remained with him while the other two carried the rest of the kit down to the spot we should have been in the first place. The dying soldier began to decorticate and I realised his end was near. I spoke to him in English hoping he might understand, letting him know he was with people who cared and we wished him peace. I could only say over and over again in my basic Shona - "Fambai zvakanaka shamwari "- go well my friend. I held his hand and put my other hand on his shoulder. This was to be the first time I had witnessed a human death so intimately and certainly one as violent as this. I was calm and resigned to what was happening for him. I cannot be certain when he died because the helicopter returned and we readied everything for embarkation. It arrived with its customary noise and mayhem and this time the pilot held the craft with the uphill skid on the ground and the other two metres off the ground. This was where we had to get aboard. With great difficulty the three of us left on the ground lifted the tarpaulin with the soldier on it so that it could be grabbed by the wide eyed occupants aboard the helicopter. As they grabbed the tarp and pulled him aboard an accumulation of matter and blood poured off the sheet and over Pete and myself. It was a gruesome moment. With the soldier's body aboard (because I think he died about then) we hoisted the remaining kit up and then clambered up onto the skid to climb into the cabin, except the cabin was an untidy mess of kit and two bodies. I held onto the doorway as the helicopter took off and banked out over the Haroni Gorge. I could see far below me the rapids of the river I had often dreamed of kayaking down one day and in a bizarre change of perception, I felt a buzz of excitement at standing on the skid of the helicopter as if flew out over the forest. For a brief few moments I was a Rambo like hero. I did find my way into the cabin and climbed over the two dead mean as respectfully as I could and wedged myself into the corner of the quilted cabin by a window. The flight back to Chimanimani village was short and before long we were descending towards the parade ground of the police headquarters. As we came in a host of school children rushed out on the landing area and I felt for the first time the icy, screaming panic which would become a feature of my past trauma distress. I feared they were about to die in the same manner as the soldier. Thankfully this did not occur. Instead we landed almost gently and with reverence given the violence of the previous few hours and the helicopter shut down. Pete and I rushed off to the police ablutions to clean the worst of the blood and gore off of us before making our way back up to the throng and begin to make meaning of all that had occurred. There was an excited buzz and our adrenalin was reignited to flow freely as we recalled the moments of the dreadful event. This process was to occur again and again over the coming days and weeks as we recalled minute details as we recounted our stories ad nauseam. We returned to the Outward Bound centre where we placated family and friends because all they had heard was that a rescue team member had been killed but not who. That night despite my exhaustion I woke with a start at one o'clock and found myself strangely alert and fired up. The event was replaying itself in my mind in vivid clarity. In the days that followed, the immediate effect I noticed was my lack of tolerance for risk involving height. Where once I would wander around a cliff edge without seemingly a care, I now needed to be securely connected. Activities that I had once enjoyed like jumping off cliffs into river pools became moments of extreme fear for me. Later, through the years I found myself becoming fearful at the sound of helicopter blades to the point of paralysis if they were overhead. Time has eased this fear and now it is nothing more than an internal discomfort which I easily shake off. However, the memories of that dreadful occurrence remain with me as clear as day, so much so that unbidden I can hear the noise, feel the scattering mayhem and smell the blood. It is a story I keep to myself but one I have wanted to share so many times. Postscript. A couple of months after the incident I had to attend an inquest of sorts held up at the Chimanimani police station. Here I met with Stella who had recovered from her ordeal and her loss of Ulf. It was lovely to see her and to wish her well because I hadn't had this chance until this moment. I often wonder about her and where her life has led her. I hope she is happy and well. World Mental Health Day - A Sea Kayaking Parable. All content copyright Nick Ray.